I couple of weeks ago my favorite stationary store closed. It was my go-to place for a whole range of things—the best selection of greeting cards, any size of envelope, any kind of pen, amusing little gifts for friends’ birthdays and even a tempting display of scarves, bags, jewelry. At Christmas it had crackers—the type that go bang, not the ones you eat with cheese. I’d always find what I needed and also something to surprise and tempt me. But it couldn’t complete with Staples and Office Max where I have to buy twenty-four envelopes when I want just one. So I find myself lamenting the last of a way of life I grew up with. The main street of small shops, each individually owned by people I knew. Granted it took longer to go to the grocer for sugar and then have to go next door to the dairy for milk. But the butcher would tell me which cuts of meat I didn’t want to buy and which I did. The fishmonger had fresh fish, delivered from that boat that morning. And the little haberdashery—well, they had everything from elastic to sewing thread to woolen undergarments. If you asked for it. They had it. And with each shop one stopped and passed the time of day. I still find that in some parts of England. When I visit relatives in Cornwall I love walking down the main street in Falmouth, gazing with longing at the fishmonger’s slab of lovely fish freshly caught. And the pasty shop with the smell of just baked pasties. And everyone calls you “My lovey” and has time to chat. It’s definitely one of the things I miss about England, although every town now has a huge hypermarket there too. But one thing that does seem to be vanishing from jolly old England is the cup of tea. It has always been the symbol of hospitality. Go to visit and the first thing the hostess used to say is “I’ll put the kettle on.” In many working class homes the tea pot sat on the hob, hot and full, all day in case somebody stopped by for a chat. And the tea stewed stronger and stronger! If someone was in an accident, suffering from shock, they were given a cup of tea. 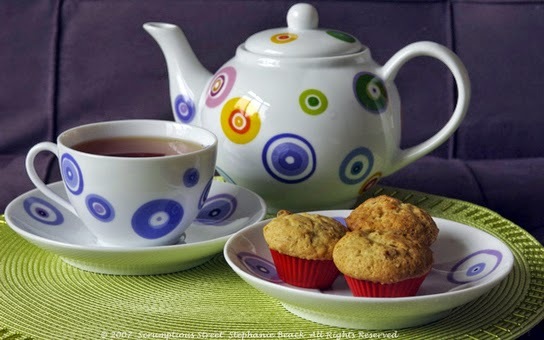 If someone was upset in any kind of disaster—the bombings of World War II, floods or fires, they were given a cup of tea. It was a symbol that everything was going to be all right. But today’s generation doesn’t drink tea. Drive around Britain and you’ll see Starbucks and Costa’s Coffee on every corner. When we stay with people it’s coffee at breakfast. Those with leisure still have their afternoon cuppa at four, but it’s mostly older folks like us. The young have no time for leisure, or cuppas. Of course one can still find tea at the Ritz (for fifty pounds or so), at Brown’s and other very posh hotels. And in Devon and Cornwall they still serve the famous cream teas with local clotted cream. Yum. I’m sad to see tea dying out—both as a drink when one needs a pick-me-up and as a meal in the afternoon. To me it was the most civilized of meals—tiny cucumber sandwiches, home made scones with jam (and sometimes cream), little cakes, slices of rich fruit cake. All extra calories, I confess, but such pleasant calories with time for chatter and reenergizing. We sometimes serve tea as a treat to family and friends, but mostly they are too busy—rushing off to swim practice or karate or with too much homework. We live in a world that is too busy, too rushed, and that’s a great pity. So what do you miss about our current lifestyle? Any nostalgia to share? So sorry to hear about your little stationery shop --- my favorite one here closed a couple of months ago and I miss it dearly. There’s nothing quite like a lovely stationery shop . . . . Sad, too, to hear that tea time is falling away in England. I’ve never been there, but I’ve somehow I’ve always assumed the English people and tea time would go together forever . . . . I think mostly I miss time: time to sit on the porch and talk; to browse in the library; to visit with the neighbors; enjoy the flowers; wander along the boardwalk; gaze at the stars . . . .
Life has become too fast, too busy, too wrapped up in other things for the quiet moments, peaceful reflections, and stargazing. And I think we are the poorer for it. . . .
And there was a neat store called Fast Buck Freddie's that had all kinds of merchandise--clothing, furniture, tableware, greeting cards--I could always find something there. Now it's being replaced with yet one more CVS. It is so sad to lose little shops, and sad for the shopowners, themselves. I've had two true English teas, both in London. One at the Orangerie in Kensington Gardens (what a beautiful place), with my mother and daughter and then-baby grandson. The other was also special. A longtime online friend and her sister collected me at my hotel in the morning, and they ushered me around London, hitting highspots we were all interested in, including the Mod fashion display at the V&A, where we also had lunch; and Liberty, where I was determined to buy a scarf for my 50-year collection. And where we had a real cream tea in Liberty's funky little tearoom. With real clotted cream, strawberry preserves, and true scones. Delightful. The local theater--the ornate little movie houses that used to exist in every town. The local druggist with stools pulled up to a counter where you could get ice cream floats and sodas. Local grocery stores--so you didn't have to drive to the bigger towns just to get milk. Even the milkman--who delivered milk and eggs and bread and pastries. I miss seeing kids playing outside. It's all electronics now. Heads down looking at their game. Very little running and laughing. All of the museums in the UK seem to still have a restaurant with a nice selection of teas and whatnot for visitors. Such a wonderful treat to stop for a cuppa and rest a bit while doing research. So strange -- I never think to do it in the U.S. though! I miss the way the practice of law was when I first started, nearly half a century ago. It was a "gentleman's profession" and your word was your bond-- if you couldn't make it to court, you called up opposing counsel and said "Enter my appearance and get an adjournment" and he (it was almost always a "he") always did. You didn't have to confirm in an e-mail with a cc to the court that "You have agreed to an adjournment." Also, before cell phones and e-mails and texts, when you were in court, you were in COURT, and no one expected you to return phone calls during the recesses with instant analysis of a client's problems. Your secretary (who was not reachable over the lunch our, when no one picked up the phone or expected that) would say, "She's in court, can I take a message?" and you returned them when you got back (or if it was too late, then the next day). Atticus Finch could not practice law nowadays. The pace would kill him. I love the museum tea-shops, Susan. And Karen, my next Georgie book takes place at Kensington Palace so I spent several days prowling around there--and had lunch at the Orangerie. Fabulous. Yes, you can get tea in most cafes still, but coffee has definitely taken over as the drink of choice. And Ellen, what a sad and true thing to say about the legal profession--about every profession actually. In business a man's handshake was always good. The doctor made housecalls. And the village looked out for the kids. My little town still has a lot of small shops, but many are for luxuries, not necessities. I make an effort to shop local, and to remember that price is not the only value. Sometimes, though, you do need 24 envelopes, and price and convenience win. So I write books that celebrate that kind of life and wish I could do more than just visit. Great post. I have often thought about how much I miss getting letters -- real, handwritten letters -- in the mail. There's such a pleasure that comes from knowing the other person chose the paper, touched it, took the effort to find an address and write it. The Internet makes us more connected in some ways, but it happens through the smooth impersonality of a screen, which I don't like. On another note, I'm an American who adores tea (I think it comes from all those English authors I read as a child). :) There is something so comforting about hearing the kettle and putting your hands around a warm cup. I'm an American married to an Englishman (naturalized, but born and brought up in London). We have Early Morning Tea, tea with lunch, Afternoon Tea, and I like a cup of decaf tea after dinner. We make it the proper way, in a pot with a tea cosy. Our last visit to London was in 2010, and I found the situation there to be exactly as Rhys says. I used to love going to tea places in England ("Tea for two, please, tea and cakes), and scarfing down scones with clotted cream and strawberry jam. I do miss that England! I SO understand your lament! As to tea, the USA has never gotten a proper grasp on the beverage. Perhaps it's a throw-back (couldn't resist) to the tossing of tea into Boston harbor, but tea is usually an after thought. Tepid water, inferior brands, charging for a second cup of tea but unlimited refills of coffee, etc. I went to England in high school (back with the dinosaurs). It was a thrill to get real tea wherever we went. Even served on a tray at my seat during intermission at the theatre! Heaven! But I returned 4 years later and "real" tea had been replaced with tea bags. I knew it was the beginning of the end. Ah, for a bit of civility. I was going to say I miss family restaurants, then I remembered that I have breakfast at one every Sunday after church with some friends. The restaurant is family-run and the owners are welcoming to family groups as well as to other diners. Customers, owners, employees, all know each other's name. If an employee or "regular" customer is missing one Sunday, everybody else wants to know if the person is sick, on vacation, whatever. It's our own version of the TV program Cheers: a place where everybody knows your name. I do miss the old-fashioned stationery stores. I am a sucker for note cards, especially with a a nature theme. If I see some I like at a small non-chain store, I nearly always buy a box or two. Craft fairs are good places for buying note cards and you can often even meet the artist who designed them. I'd still prefer to browse in a stationery store, though. My dad co-owned a paint and hardware store in my home town. After his premature death, I could not bring myself to go into that store again. I have on occasion purchased paint from big box stores but I feel like I'm letting Dad down when I do that, even though his store is long gone and I have not lived in that city for many years! I plan to make an effort to check out the small, locally owned paint stores in my area for my next painting project. With we of Irish decent tea is still and important part of the day, though mine has dropped of off to afternoon and evening. I miss tea with my grandma. But finding items for the Holidays can be hard. I am sad about the loss of easy to find items in small stores! Big stores if they have what I am looking for seldom have it where I think they would be! The little shops even here in the U.S. have gone, and sadly we have never had tea shops like in London or Ireland even though they are diminished. Susan, you are missing out! I've found that museums often have the best places for lunch. Our wonderful Cincinnati Art Museum has an award-winning, and lovely, cafe, for instance. My brother, who grew up in the same household I did, with inveterate coffee drinkers, won't touch the stuff. It's tea or nothing for him. My parents (and my mother's parents before them) bought meat from a German-American family's stand at the city market in Indianapolis. Just as you mentioned, they would tell my mother or dad that one cut was better that day and another not as good if they mentioned that one. They wanted to keep longtime customers so they always recommended the best cut that day for whatever my parents wanted to make. My husband can't take a lot of caffeine and we like tea. A friend of mine introduced me, and then I introduced my husband, to PG Tipps tea. She had studied at Cambridge and would have friends send her some or bring some back if they went over to England. In Chicago you can find it, though usually only the tea bags, but it is much better than any of the other 'English Breakfast' or 'Irish Breakfast' teas that other companies sell, a richer deeper flavor even from a tea bag. We drink other decaf versions of teas at dinner, but PG Tipps at breakfast. And, yes to missing the small stores. They often have a more interesting variety of items because they reflect the owner's tastes and they know their customers' tastes personally so they buy things they know will sell in their community. I miss my grandmother's kitchen in Boston. The aluminum pot with its dents and stains for tea in the kitchen. The old table that fed a family of ten. The highchair waiting in the cupboard for the next child to come along. My father, his brother, their six sisters all sat in that chair. Me. My cousin Anne. William. Barbara. Then William's kids. Margaret's grandchildren live there now. The chair is there for them. A new dog sleeps under the sink where Peter the collie once slept. Peter then James, Sheila and Taxi. Taxi? Kevin named him. Kevin is gone now. Claire, Margaret. Paul, Paul, and Paul. Ellen. Anne. Barbara. Lindsay never had a chance. Tom is gone. Our precious avenger of wrongly accused. He sat in that highchair once, too. Policemen and women. Poets and priests. Lawyers and singers. Dreamers and talkers. Dreamers. Dreamers. Dreamers. Fueled by tea from that aluminum pot I miss. I miss going into a shop and being surprised by unique merchandise. It seems that everything has a sameness about it. I want to be able to find that one special thing (to me), among all the other strange and wonderful items. I'm sorry to hear that tea is disappearing as an institution. It's always seemed so quintessentially British to me. Luckily, my anglophile mother instilled in me a love of tea - the drink and the meal - which I've passed down to my daughter. Where most college kids drink specialty coffee, she has her own tea set in her dorm room, and drinks tea by preference. She and her friends are tea connoisseurs - not just black teas but green, rooibos, and herbal tisanes as well. Also luckily for me, I live near a historic town with a historic downtown shopping district, where I can visit the Pennsylvania Tea Company shop for all kinds of specialty loose-leaf and bagged teas! Tea is always such a treat..and I always think about the people involved with those little stores.. how their lives change, too. RHYS! I will see you tonight! YAY! I was so lucky to grow up in a small town where the downtown was full of little shops, including a stationary store, a dime store, little diner restaurants, an old-fashioned drugstore with counter to order chicken salad sandwiches and orangeade drinks, a home-owned department store, shoe repair shop, local jewelers, and more. My father also had his real estate office in the bank downtown, and the high school I attended was on the main street in town. It was an ideal place to grow up with a community of people who knew you and you knew them. Rhys, I'm so disappointed that England is moving away from its tea traditions. Although I mostly drink coffee, I have always dreamed of an England with teas, and I still hope to get there to partake someday soon. Also, I'm sorry about your stationary shop. The one I frequented growing up closed many, many years ago. Lucy, I looked for Fast Buck Freddie's when I was in Key West last month, and was sad to see it gone. Oh, and I have a personal connection to family-owned businesses and their demise. When I married my husband, his family had a large TV and Appliance store, with locations in several cities. Furniture was added later. The stores had been in business since the late 50s and closed in the mid-nineties. I worked there, as well as my husband and his parents. We can all give a big shout out to Walmart for playing its major role in the closing of so many small retail owners' businesses. Our stores offered service (try to get service on a product these days), and we knew our customers. Now people have the wonderful anonymity and no-care dealings of the big box stores. Yorkshire Gold for me, please, or a nice cup of Darjeeling! No one can take tea time away from me. I always carry my favorite tea bags in my purse because a good cuppa in a cafe or restaurant in the USA is the exception, not the rule. At home, a silver tray lined with a lace doily is topped with my Myott Meakin blue and white English teapot and tin of tea. A blue and white ceramic electric kettle is nearby, kept filled with filtered water and ready to boil. I wake up longing for my first cup of strong black tea, often brought to my bedside by dear Hubby who is more a morning person than I. In the afternoons, I take a break for a lighter tea with a touch of bergamot and a figgy biscuit. Before bed, a decaf Ahmed Evening cuppa sends me off to dreamland. You are welcomed to join me anytime.